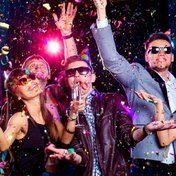 Songs for the perfect New Year party. A dozen publications are collected for you by editors and journalists, from Poster to Kommersant. Listen to the collection new Year party in high quality, absolutely free. You can listen to the whole collection, or separately song by song. In addition to new Year party of the collection, you can find any other one by following the link and get information with the already collected collections and collections of tracks, songs and music.